●Germany has the fourth largest economy in the world—America has the largest economy—followed by China—then Japan–then Germany. ●Germany has the largest economy in the whole of Europe—by the way, its economy is far larger, and more powerful than the Russian economy. ●Germany is the world’s No. 3 arms exporter, after the United States and Russia –(most people are amazed at this stat)– Israel and Saudi Arabia, are among Germany’s elite customers. So are Algeria, Qatar and the United Arab Emirates. ●The Israeli Navy presently maintains a fleet of five state-of-the-art German underwater submarines of the Dolphin Class, which can be equipped with nuclear warheads, with a sixth due for delivery this year. Germany makes some of the world’s most advanced high-tech submarines. ●Approximately 30.8 per cent of Germans, or 24.7 million people, are Catholics, while 30.3 per cent, or 24.3 million people, are Protestants. German citizens give billions of dollars every year to the Catholic Church. ●There are approximately 117,000 Jews living in Germany today, compared with 475,000 Jews living in France. ●Did you know that Germany is home to the largest Turkish population outside of Turkey in the world –there are nearly 3.5 million Turks who live in Germany. ●Turkish President Recep Tayyip Erdogan has called Germany’s ruling politicians “enemies of Turkey” who deserve to be rejected by German-Turkish voters. Germany will hold a general election on September 24th; about one million ethnic Turks living in Germany can vote in that election. ●Here is a strange fact: Germany has one of the lowest birthrates in the world. You might say there is a scarcity of children in Germany. Over the past 20 years, about 2,000 schools were closed in Germany because of a scarcity of children. ●Deutsche Bank is Germany’s biggest bank, and the second-largest bank in Europe, Deutsche Bank is not doing well. This matters. Deutsche Bank is one of the world’s 10 largest banks in terms of total assets– the International Monetary Fund has said it’s “the most important net contributor to systemic risks” to the global financial system. So, if Deutsche Bank gets into trouble, this will shake the world financial markets…we will have more to say about Deutsche Bank in upcoming radio broadcasts. ●Deutsche Bank holds the world’s largest high-risk derivatives book—its portfolio of financial deals based on the value of other assets. It peaked at over $75 trillion. This position is very high risk. American leadership in Europe is in decline—someone must fill that leadership vacuum—only Germany can do that. Bible prophecies describe the final revival of the Roman system as a mysterious beast (Daniel 7:7, 19–20; Revelation 13:1–10; 17:3–8). We believe that history and biblical patterns tell us that this final beast system will be a European system that emerges just before Christ returns—so continue to watch what is taking place in Europe, no doubt Germany will be the leader of this end-time “monster”. Germany is not an aggressive power today—but that will change in the years ahead. 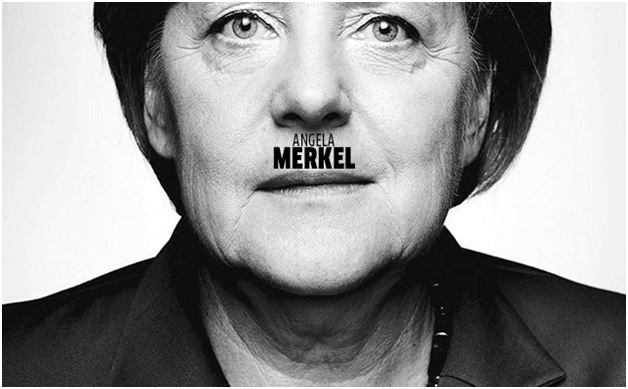 A TURKISH pro-government newspaper has depicted Angela Merkel as a Nazi, using a mocked-up image of the German Chancellor with a Hitler-style moustache and labelled her a female Hitler on their front page. After a year of threats, digs and quarrels, Germany and Turkey are now preparing for a showdown that could shake the European Union, alter the fight on terrorism and accelerate the refugee crisis. Germany, Europe’s biggest economy, and Turkey, the only North Atlantic Treaty Organization member in the Middle East, have had a hot/cold relationship for years. Germany imported hundreds of thousands of Turkish workers to help rebuild the country after World War II and now is home to nearly 4 million people of Turkish descent. For Turkey, Germany became a passage to the West, one of its biggest trading partners and a major source of tourism revenue. In early July, on an island near Istanbul, Turkish police closed down a seminar on data protection and seized a German Amnesty International activist, Peter Steudtner. He and five others were later charged with aiding terrorism and put in prison. Germany believes that Mr. Steudtner’s detention represented an unjust case of imprisonment of a German citizen. This is of great concern to the German government. Recently, Germany has been concerned about what they see as Turkey’s attempts to stir up unrest among citizens of Turkish descent living in Germany, many whom backed Mr. Erdogan at recent polls. Turkish leaders wanted to campaign in Germany—where nearly 1.4 million Turkish voters are registered—for Turkey’s referendum this past April; but German officials banned such rallies for safety reasons. This angered Turkey’s leader, Recep Tayyip Erdogan. It is a complicated relationship (between Germany and Turkey), which we will discuss in future radio broadcasts. Just remember that Turkey is the gateway for refugees who want to enter Europe from the Middle East. The European Union paid Turkey $3.2 billion in EU aid to take care of the 2.2 million Syrian refugees in Turkey. The money is intended to advance the refugees’ living standards so that the refugees will not attempt migrating to European cities. 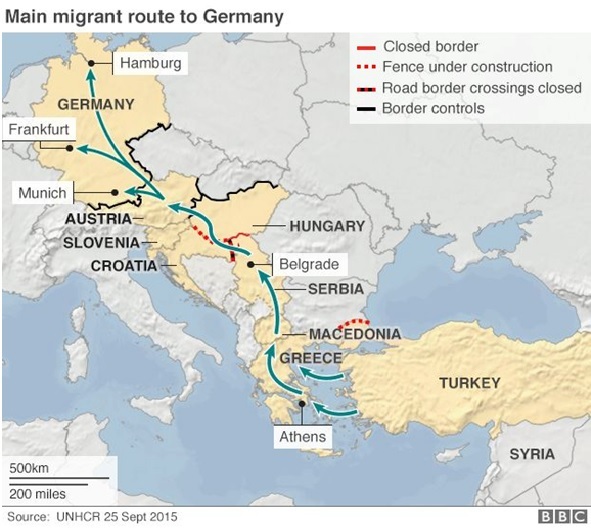 Turkey could turn the spigot open, and hundreds of thousands of refugees could pour into Europe. Turkey is in a powerful position to get its way with Germany and Europe because of the refugee dread that has overtaken Europe—more later, on this developing story. To be blunt, Turkey and Europe are “unequally yoked”—they have different cultures, religions and economic priorities—they will never work well together—and the European Union, has no intention of allowing Turkey its request, which is to become a European Union member. This has created resentment in Turkey. As we continually see, Middle East relationships are layered with intrigue and complications. The geopolitical reality is that Israel and Saudi Arabia are working together to fight Iran in Syria. The Wall Street Journal has reported that Israel and Saudi Arabia have been supporting rebels in Syria who are fighting against the pro-Iranian Assad regime in Syria. The Saudis are providing weapons to the rebels, while Israel has been providing them with food, fuel and medical supplies. The Saudis are Sunni and Iran is Shia. The Saudis and Iranians hate each other. The geopolitical reality is that Israel and Saudi Arabia are working together to fight Iran in Syria. The Wall Street Journal has reported that Israel and Saudi Arabia have been supporting rebels in Syria who are fighting against the pro-Iranian Assad regime in Syria. The Saudis are providing weapons to the rebels, while Israel has been providing them with food, fuel and medical supplies. Saudi Deputy Crown Prince Mohammed bin Salman – the man who is now in charge of Saudi oil policy – ruled out any dialogue with Iran and pledged to protect his traditionalist kingdom from what he called “Tehran’s efforts to dominate the Muslim world.” Saudi Deputy Crown Prince who is also Defense Minister for the kingdom recently said, “We will work to have the battle in Iran rather than in Saudi Arabia.” Iran, never one to leave a pugnacious comment by its Saudi archrival unanswered, responded when its defense minister said on that Iran would hit back at most of Saudi Arabia with the exception of Islam’s holiest places if the kingdom does anything “ignorant”. “If the Saudis do anything ignorant, we will leave no area untouched except Mecca and Medina,” Defense Minister Hossein Dehghan was quoted by the semi-official Tasnim news agency as saying. Adding yet another layer to this row… Saudi Arabia has cut off ties with Qatar because Qatar is too friendly with Iran. Saudi Arabia, the United Arab Emirates, Bahrain and Egypt severed diplomatic ties with Doha and closed their air, sea and land borders to the tiny Persian Gulf state. Iran has come to the rescue of Qatar having sent hundreds of tons of food to Qatar in recent days, because Qatar is almost entirely dependent for food from foreign exports. So this means Iran is now more engaged in the affairs of the Arab world because they are helping Qatar; remember most of the Arab monarchies loathe Iran. Qatar needs to get food somewhere so now they are relying on Iran. This proxy war will only get worse in the months ahead—there is no solution in sight! Another Middle East nation that has not abandoned Qatar is its long-time friend Turkey. Turkey has constructive dealings with Saudi Arabia and the United Arab Emirates as well; but Turkey sponsors Qatar’s efforts to stand up to Saudi Arabia’s authority in the Middle East; Why– because Turkey wants to become the dominant Sunni power in the region. Expect greater pandemonium in the Middle East! Remember the prophecy in Genesis 16:12; Syria, Iraq, Afghanistan, Libya, Yemen are all broken. Brother against brother, tribe against tribe is the theme playing out in much of the Middle East. The prophecy of Ishmael’s descendants, that they would be engulfed in endless conflict is what we see today: “his hand will be against everyone and everyone’s hand against him, and he dwell in the presence of all his brethren” Genesis 16:12. 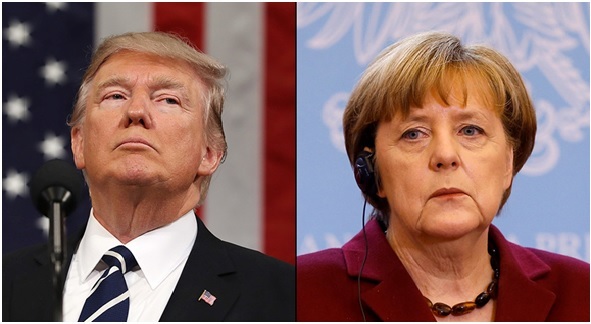 German Chancellor Angela Merkel’s announcement that Europe can no longer rely on America as a partner and “must take our destiny into our own hands” marks a major turning point in America’s relationship with Germany. Chancellor Merkel no longer uses the word “friend” to describe the United States in her talks to the German people; this is not a small rupture in friendship between the leadership of the two nations. American and German priorities are different, and this is creating enormous stress between President Trump and Angela Merkel. 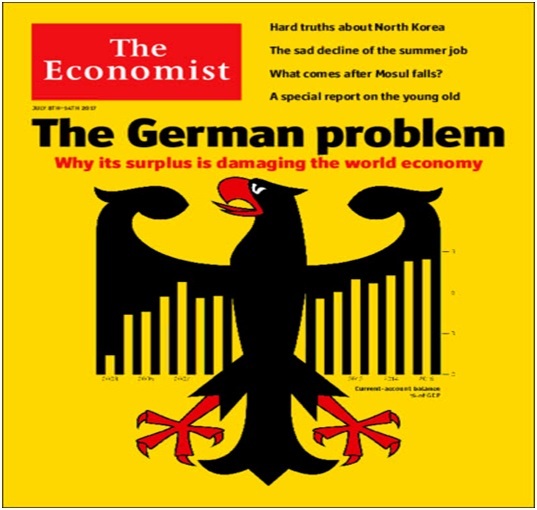 Germany has built its power on economic rather than military muscle. Given the focus of German power, Berlin has little desire to become snared in American global actions (such as action against Russia regarding Ukraine). The United States has no patience in working through Brussels and wants Germany to be more responsive to the American agenda in the Middle East and Eastern Europe– seeing that America is a major export destination for German goods. In essence the Trump administration sees Germany as not being grateful for the open door it has to the thriving American consumer market. Business tension between the two nations is continuing: For example; Commerce Secretary Wilbur Ross, lectured German Chancellor Merkel about buying American raw materials rather than buying Russian goods. Also of note, after the U.K., the U.S. is the second-largest market for the German car industry. The German BMW, Daimler-Benz and Volkswagen manufacturers produced more than 800,000 automobiles in the United States alone. German companies are the third-largest foreign employer in the United States, with over 670,000 workers. Both countries need each others business. Another area of stress; The U.S. wants NATO to be a military alliance with all members having a substantial military capability. Germany wants NATO to be predominantly a political organization with a secondary military role; it boils down to the fact that Germany does not want President Trump telling it what it should be doing within the NATO alliance. Germany sees itself as the leader of NATO…not America. Until now, the pivotal relationship in American foreign policy in Europe has been with Germany. That tie appears to be on the verge of breaking. It will be no small paradox if President Trump has provoked many of the nations of Europe to begin the process of converting itself into a cohesive great power. Meaning, that many European countries will seek to form a greater and even stronger Union (based upon German leadership), as a result of disagreements with America. American leadership in Europe is in decline—someone must fill that leadership vacuum—only Germany can do that. 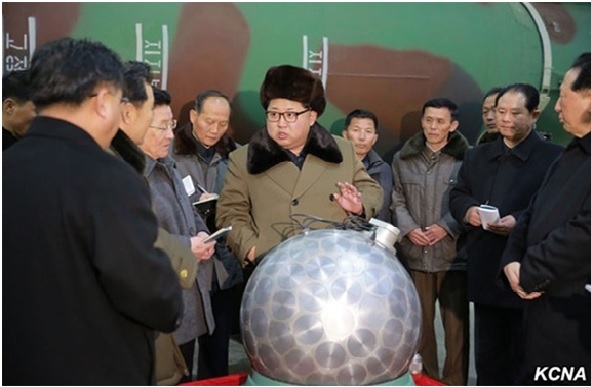 North Korean dictator Kim Jong Un shows off what is claimed to be a spherical nuclear bomb in early 2016. The U.S. doesn’t want war, but it thinks North Korea has already crossed a red line. North Korea is estimated to possess up to 20 nuclear weapons and a wide-ranging arsenal of ballistic missiles, all capable of striking neighboring countries. The United States already has over 100 F-16 fighter aircraft in South Korea. They have been conducting exercises in South Korean airspace regularly for some time — we need to watch this as these kinds of exercises often take place before an attack. Such was the circumstance before Operation Desert Storm. Asked by Congressman Tim Ryan why we don’t launch a war to end this threat, Defense Secretary James Mattis replied that, while we might “win … at great cost,” such a war would “involve the massive shelling of an ally’s capital … one of the most densely packed cities on earth.” Seoul has a metro-area population of 24 million. South Korea, which would endure the brunt of the war, is looking for a way to bring North Korea to the negotiating table. If Washington is compelled to move resolutely toward war, the South cannot prevent it. But Seoul will try to stall the U.S.
There’s still much we don’t know. For example we don’t know how exactly North Korea would counter an attack by the U.S. Its leaders are seemingly swaggering in their behavior, which has all but taunted Washington to attack. Either they are bluffing or they have doable options for a counterattack. Maybe they are further along in their nuclear program than the U.S. thought. Maybe their ballistic missiles can reach Japan and Guam. They don’t seem to be afraid of a war. This is a very dangerous situation that we are watching closely on a daily basis. President Donald Trump, speaking alongside South Korean President Moon Jae-in said in a statement from the Rose Garden, declared, “The era of strategic patience with the North Korean regime has failed, And, frankly, that patience is over.” Let us hope that we are only dealing with the rumor of war and not a future war between North Korea, the United States and South Korea. Such a war would result in massive casualties (Matthew 24:6).